Loose-fit tee made of comfortable and easy-care cotton-spandex quality, with four Blutsgeschwister street-style prints. 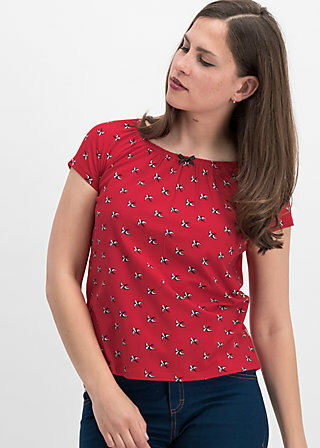 The supple material and unparalleled comfortable cut make this tee a favourite among all Blutsschwestern (blood sisters)! Short raglan sleeves, a comfort fit and the uncomplicated round neck with an elastic band and a playful crimping give this richly patterned top a cute look, ensure a great fit and promise you a fantastic wearing experience. A delicate satin ribbon on the front neckline edge completes the charming look perfectly.